The simplicity of a grin can affect fraternity members forever when working with special needs students. That’s the measure of the effect students at a local high school have upon Pi Kappa Phi Fraternity members. A smile, a hug, a high five, a song – they make a difference on Purdue students who volunteer in classes serving high schoolers with moderate cognitive intelligence. 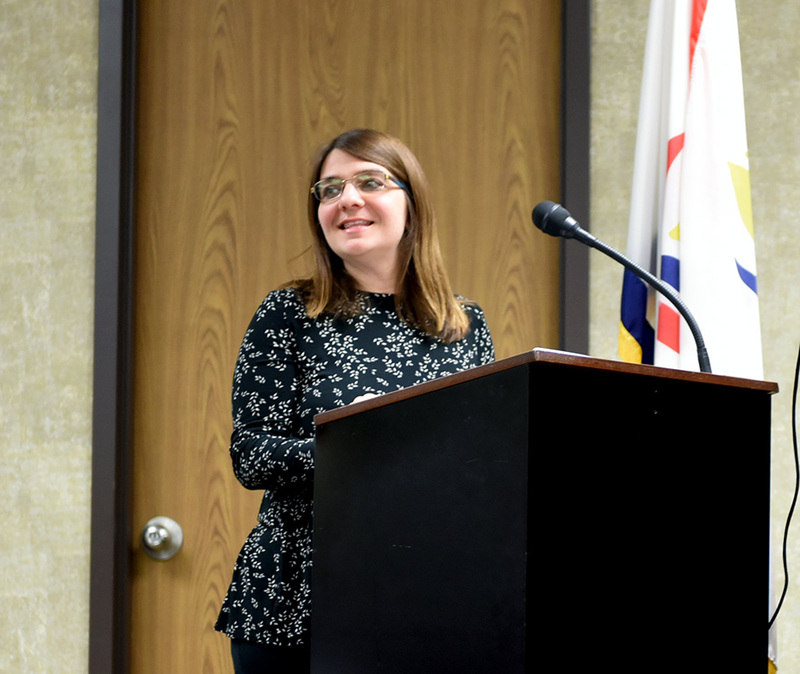 The fraternity celebrated those joys along with financial support from Circle of Giving grants from the Ability Experience on Nov. 12 at a local school board meeting. 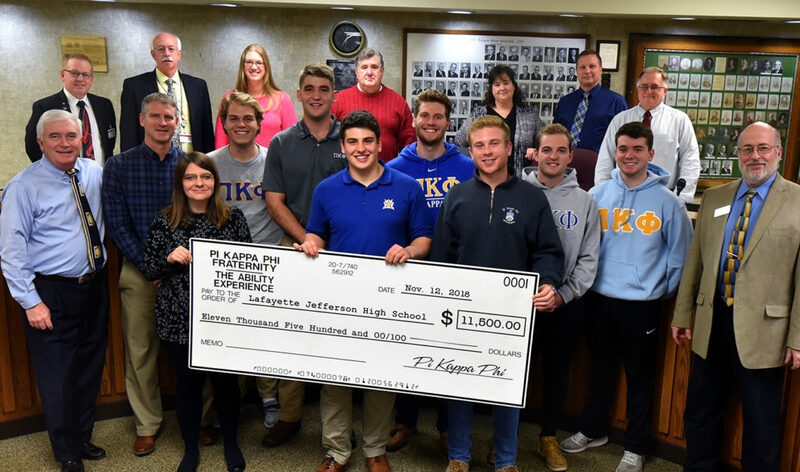 School board members recognized fraternity members who presented a check for $11,500, which represented grants from the Ability Experience, Pi Kappa Phi’s national philanthropic effort supporting people with disabilities. A portion of the chapter’s annual philanthropic fund-raising plus some extra cash support was given to the school to support programming efforts in special needs classes at Lafayette Jefferson High School. 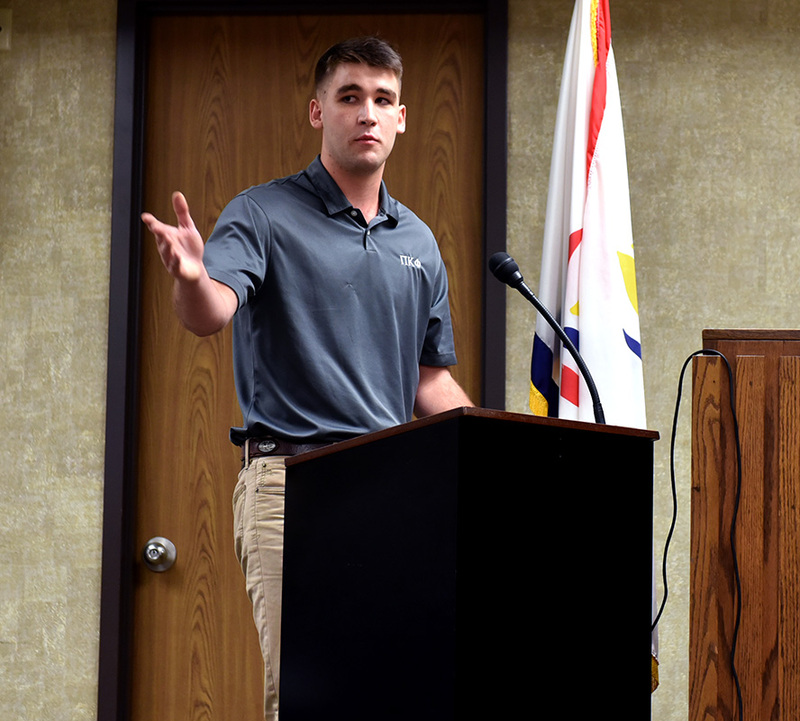 Nathan Longo addresses school board members. 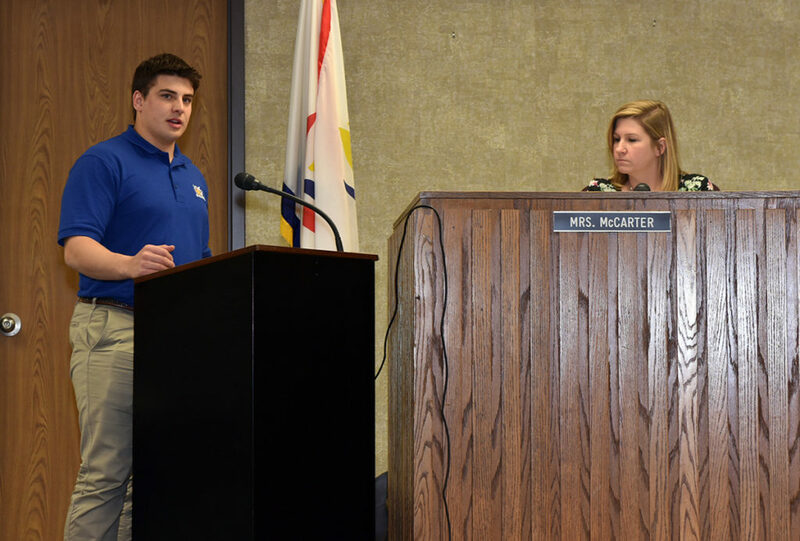 President Nathan Longo told the school board of all the things chapter members do to support people with disabilities in the classroom and in the community. He said the emphasis is on setting a standard of servant leadership at Purdue. But it’s the direct interaction with students in the local high school classroom that has a lasting impact. “What makes all the work, the event planning, the fund-raising hours all worth it for the Ability Experience is seeing the smiles on the faces of all the students at Lafayette Jefferson and knowing what we do truly makes an impact,” Longo told the board. Jack Russell points to his fraternity brothers in the audience as people who are impacted by volunteering. Jack Russell, a chapter member who regularly volunteers at the school, agreed. Russell, an ROTC student from Little Rock, Arkansas, says he’s been changed by his interaction with special needs students. Several days each week, chapter members travel four miles from campus to the high school. There they assist the special education teachers and make a difference. Special Education Teacher Alyssa Montgomery looks to fraternity members in the audience to thank them for assisting in her special needs classes. The fraternity has volunteered in the classroom since 2007. 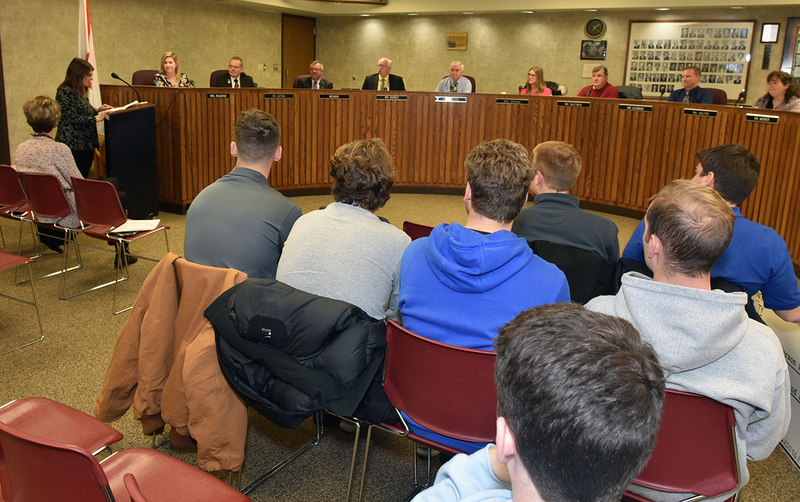 Annually, the school board gives the fraternity time at a school board meeting to thank the members. To a person, board members go out of their way to say thank you collectively and individually. Superintendent Les Huddle (center) thanks fraternity members. Superintendent Les Huddle echoed that sentiment. School board members and staff pose with fraternity members and a check for $11,500 to assist special needs classes at Lafayette Jefferson High School. I am going to talk a little about what the chapter does for the Ability Experience, which is our philanthropy and now that relates to our relationship with Lafayette Jeff. The Ability Experience is our philanthropy and we raise money and awareness for people with disabilities across the country while forming men of Pi Kappa Phi into servant leaders. That is the mission statement of the Ability Experience. We do this through several media. One of them is through national events such as the Journey of Hope which is a bike ride across the country – a summer long experience that we usually have 9 to 12 members do each year. Also through local fund-raising events, local awareness events and our interaction with the partnership with Lafayette Jefferson. To dive deeper into some of our local events, throughout the year we put on several events. One of them is the War of Roses, which happens in the spring. Though this we do several events that includes contests between sororities with a main contestant who will compete to be our fraternity’s sweetheart. Through that process, we raised more than $6,000 in 2018 for the Ability Experience. Additionally, we have the Pi Kapp 100, which is bike ride from Zionsville to our West Lafayette chapter house – we do that in April. Then in the fall we have our Abilities Week, which is highlighted by the David Feltner Memorial 72-Hour Bike a Thon; this year we raised more than $5,000 during that event. We also do fund-raising with our alumni. In 2017, our chapter raised $20,092 for the Ability Experience. In 2018 so far, we are up to just more than $17,000 with more end-of-year donations coming in each day. That’s not to mention the more than $53,000 our chapter members raised this summer for biking across the country. Now, I want to talk about how the $11,500 we are presenting to the school board tonight comes from. Every year, we have the opportunity to apply to the Ability Experience to get one-quarter of the chapter’s fund-raising back to a local organization. This is called the Circle of Giving Grant and we choose our recipient to be Lafayette Jefferson. In April, the CEO of the Ability Experience presented at our annual Moms Day banquet with our Circle of Giving Grant. We were presented with $6,500, which was an extra $1,500 for our effort to this partnership with Lafayette Jefferson. Additionally, last fall the Ability Experience presented us with a $5,000 additional grant, which was a surprise to us to reward us for the work we do through our local events, fund-raising and continued relationship with Lafayette Jefferson. What makes all the work, the event planning, the fund-raising hours all worth it for the Ability Experience is seeing the smiles on the faces of all the students at Lafayette Jefferson and knowing what we do truly makes an impact. The partnership has had a profound impact on my life and I have only been going to it for a year now. I like to think that I am pretty involved on the Purdue campus. I do an Alpha Omega church group every week, I’m involved in the Marine Corps ROTC at Purdue and obviously Pi Kappa Phi. Out of all those organizations, the partnership is where I will have the most cherished memories. Whether it’s a memory from the first couple of days I went there was guy named Kevin in the class. He spent hours trying to teach me how to play Yu-Gi-Oh (a Japanese card game with magic players). Unfortunately, I still don’t know how to play Yu-Gi-Oh, but he gave it his best shot. Or it’s a memory such as Alyssa; she’s a girl who if she wants do something she will sing. For example, she would sing to me I Like to Move It Move it from Madagascar any time she would want to walk around or move around the school. Then if we were walking just by ourselves, police officers and security guards would see her and recognize her, so she even has a profound impact on people outside the classroom. Every time we walk in, for example, last year there was a kid named Matt. He would run up to me and hug me or have a smile on his face. Just seeing those smiles on those kids faces when we walk in in the first 5 seconds – the impact we can see on their faces, does so much for us. It’s really a truly humbling experience. It’s memories like these that our brothers share. We’ll get back to campus and realize it’s an amazing thing to sit down and talk about the funny things that happened and the really cool and inspiring things that have happened. Out of all that, these kids will have more of an impact on me in my life and all my brothers lives then we will ever have on their lives. That’s truly a humbling, humbling thing to know that in college us brothers found that light on a rainy day that we all wish to find. So, for them, I am eternally grateful for all the programs that we do, but for these kids and Miss Alyssa and what she does for them and y’all for allowing us to go to the partnership. I want to say thank you and God bless the partnership. Thank you. I want to say thank you guys. It’s been 9 wonderful years that Pi Kappa Phi Fraternity has included my class as a recipient of the Ability Experience, which serves those with disabilities. Most of my students are moderate cognitive intelligence and require one-on-one assistance with learning basic life skills – from simple communication, reading, math and even telling time – you guys know that because you help often in the classroom. Today there are so many demands working with limited funds for the staff is challenging. However, with the presence of the Pi Kappa Phi brothers it continues to be a blessing. It’s a truly wonderful experience for my students to interact and learn from each of your brothers. They definitely get excited when they come into the room because they see me every day. So, having the brothers and Purdue people there is really exciting. The Pi Kappa Phi Fraternity monetary donation has helped my life skills class at Jefferson High School. Because of your donation my students participated in several community outings, but most important are the everyday necessities needed for my life skills classes just being able to purchase food items and basic toiletries. So, gentlemen I sincerely hope we continue to build on this wonderful partnership because the impact of the fraternity’s donation truly makes a difference in our community and most of all for my special needs students. On behalf of myself and my students at Jefferson High School we’d like to say thank you to the Purdue guys from the bottom of our hearts. Thank you again for your sincere kindness and overwhelming generosity. So, thank you. I want to thank you for your continued support, not only financially but also for the classroom support. Obviously, the board of education understands the importance of homework and I am sure that all of you have some tonight, so feel free to dismiss yourselves whenever you are ready. And, again, thank you very much.